I still love Aldi, but there are several foods that I've had to shop elsewhere for recently. Eloise has been a picky eater since, well, forever. But it was especially bad in the last four months. She would literally not eat anything. In retrospect, I do think a lot of it has to do with the fact that she has 16 teeth when many of her peers have far fewer. Poor girl has probably been in pain for a long while. That said, I have slowly found some things she loves to eat. As much as I'd like to say they're all whole foods, I have also had to rely on a few "products" if you will. But I'll get to those in a minute. Let's just jump in . . . and I'd love to hear your make-life-easier food suggestions. I've included Amazon links so you can check out more reviews, ingredients, and just more general info. Always price-compare, as I've found that grocery of Amazon can either be good deals or AWFUL. There are a variety of flavors of this mayo. Stephen and I are addicted to chipotle mayos of various brands. The just. 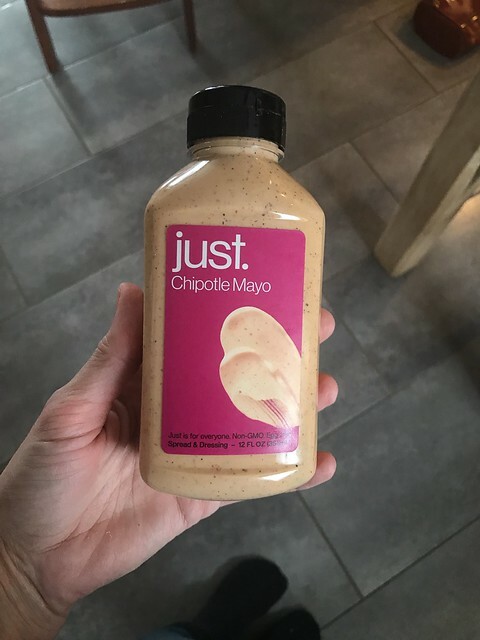 chipotle mayo is consistently the least expensive and gets high marks on taste. It's also vegan -- at least I know that several varieties of it are. Another favorite is the sriracha. We put it on veggie burgers, use it as dip for fries, and as a spread for sandwiches. 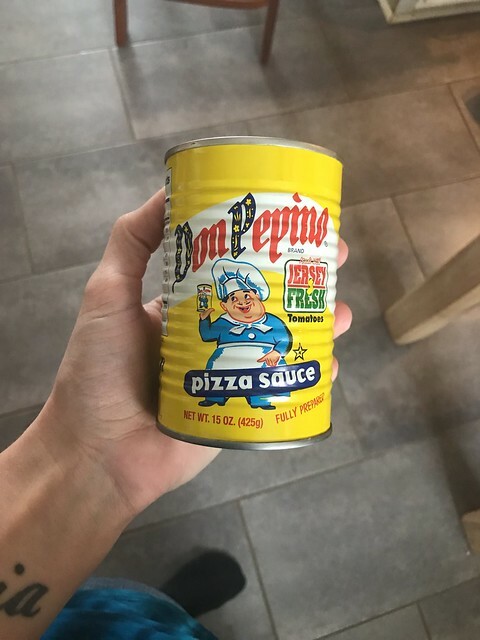 Our family absolutely loves Don Pepino's pizza sauce. Stephen it biased, since it's made in NJ. It's slightly more expensive than some store brand sauces I buy, but the texture and flavor make it worth it in my opinion (especially since homemade pizza costs so much less than takeout). I know I included the Amazon link, but I highly recommend checking your bulk stores for this brand as well. I once found GIGANTIC tins of it at Sam's that I then divided into smaller portions and froze. I don't necessarily endorse this brand of muesli over another (there are SO MANY). I'm just addicted to the stuff. 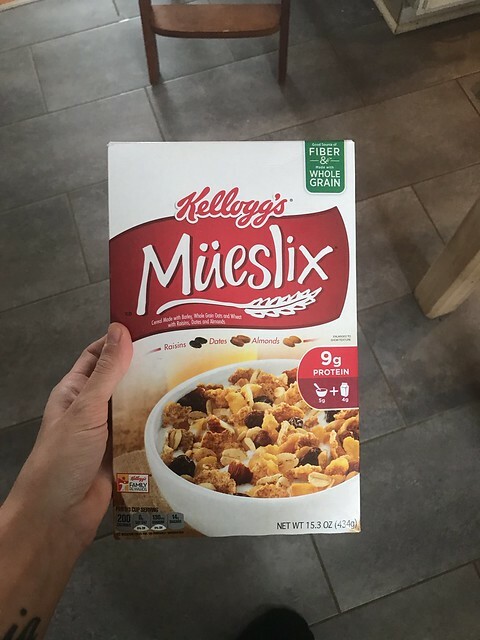 I have a thing for cereal and I feel like this is healthier than other varieties I enjoy. I used to make my own muesli, but these days I haven't made time for it. Hoping to get back into that mode at the start of the new year, though. Here's one of those foods that Eloise will eat without fail almost every day. 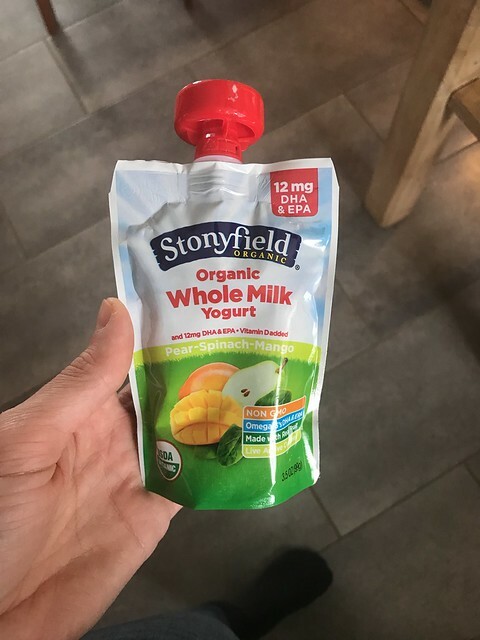 So, we have had this issue where she doesn't want to drink milk since her first birthday. Not that she necessarily HAS to drink milk, but I think it's a good source of calcium and protein in a vegetarian diet. Anyway, we're working on the drinking milk thing. In the meantime, she's been eating this yogurt and having cheese sticks. I've made my own yogurt in the past (and love it! ), but she digs this flavor. And this is often Eloise's lunch. I know, I know. I mean, it's protein waffles. Sort of strange to push on a toddler. 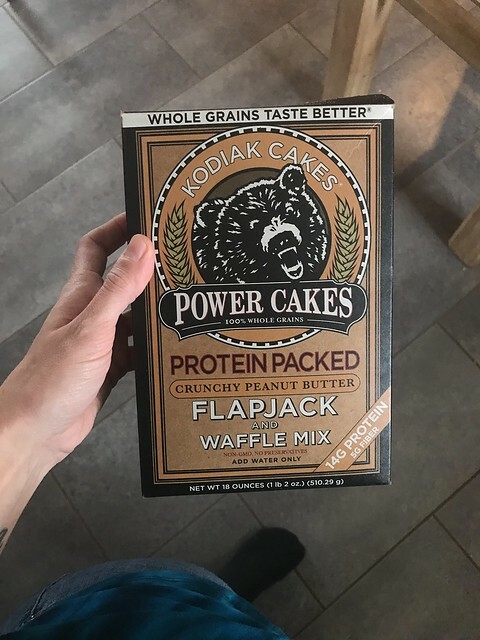 But she likes muffin texture, and I like that Kodiak Cakes has added protein and it's fast. It also comes in fun flavors -- of which we like chocolate and peanut butter best. Have you guys tried this stuff? I want to get plain buttermilk next. 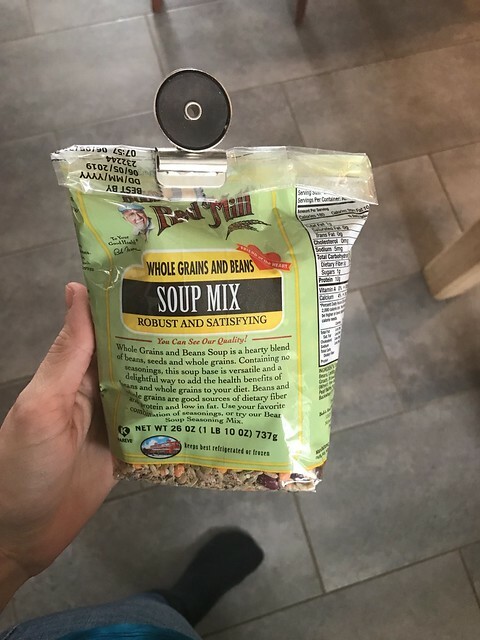 These dry soup mixes have been A LIFESAVER and have massively improved our slow cooking dinners. We got into a soup and chili rut, so I decided to branch out one day and buy a few different varieties. Anyway, this one is my favorite. The prices on these guys on Amazon aren't good, so I include the link only for reference, ingredients, and such. 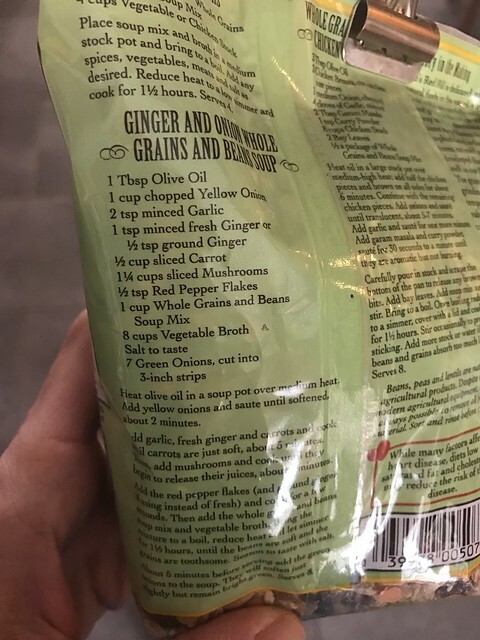 You must try this recipe on the back of the bag, by the way. And if you DO plan to try it, I recommend adding a can of coconut milk in place of two cups of water and added a heaping tablespoon of miso to the mix. I like adding the gourmet mix of mushrooms I get at Wegmans and plenty of fresh ginger.